Who may benefit from a rhinoplasty? The shape of a person’s nose is largely an inherited characteristic. The shape is determined by the bone and cartilage which make up the skeleton of the nose, over which the skin is draped. Some people are unhappy with the size or shape of their nose. Injury can also lead to an unsightly appearance. A rhinoplasty can help in all of these situations. However, rhinoplasty is not an effective treatment for snoring, nasal obstruction or for sleep apnoea. The nose doesn’t stop growing and changing until age 16 and it is, therefore, inadvisable to consider surgery before this. Chest infection – especially in smokers. Deep Vein Thrombosis (also known as DVTs or clots in the veins of the legs) can also occur which can break off and travel to the lungs (also known as a pulmonary embolus) which can, although very rare, be life threatening. Bleeding, particularly heavy nose bleeds, can happen shortly after the operation or even up to 10 days later. This may require hospital treatment. Infection may require antibiotics and if any synthetic material has been used to build up the nose, this might have to be removed. Specific to rhinoplasty, it is possible that there may be altered sense of smell after the operation or difficulty breathing through your nose. 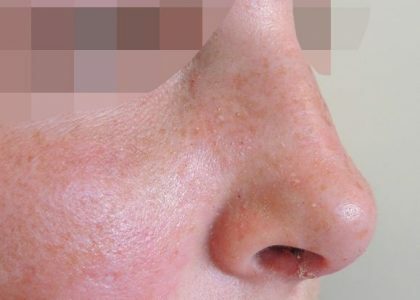 Surgery involving the nasal septum can be complicated by haematoma, infection or perforation of the septum. In a few cases these problems can be permanent. The sensation in the skin of the nose may also be changed and in particular the tip may feel numb. Even after surgery, some patients will be dissatisfied with the outcome and a second operation may be required to make adjustments. The size of you nose and nostrils may limit the amount of adjustment that can be realistically achieved. You should discuss your expectations and the limitations of the operation with Mr Andi before the operation. You can go back to work after a few days but may experience significant bruising, especially around the eyes and many people prefer to take a couple of weeks off until the bruising has largely settled. Once the splint has been removed, your nose is very vulnerable and contact sport should be avoided for a few months and you should generally try to avoid activities that might lead to your nose being knocked for six weeks. You will probably need some simple painkillers such as paracetamol to help with any discomfort. There will be a splint over your nose which must be worn for up to two weeks. You will also have packs in your nostrils and you will need these for a few days. This means that you cannot breathe through your nose. You should expect that it may also be difficult to breathe through your nose at first, even after the packs have been removed, due to swelling. It is normal to experience minor bleeding from the nostrils in the first few days. This should simply be dabbed away. You must avoid blowing your nose and you will be advised not to have hot baths as this can increase the risk of a serious nose-bleed. What is involved in the operation?